It’s what we do. We constantly weigh and measure when the differences appear greater than they may really be. It’s just more fodder for discussion, argument, betting, and fisticuffs. But does it really need to be? I say nay, or neigh, depending on your similarities to homo sapien or equine. We see this ongoing conversation in the whisky business. The big guys vs. the little guys. The monolithicmultinationalevilconglomerate and the microcrafthandmadegaragebandfamilybusiness. Of course, there’s room in the tent for all though many think there should be separate tents divided by a moat with fire-breathing dragons and vast armies at the ready to keep said tents apart. The big tents want nothing to do with the little ones unless they can take some of the upstarts’ new ideas or swallow them up in a corporate buyout. The little tents want to be left alone to do their thing. Or so the outside view might be. And there’s a lot of truth in all of that. It’s business! “You’re taking this very personal. Tom, this is business and this man is taking it very, very personal.” Little guys want to be big guys on their own terms. Big guys want to get bigger. That’s ok. It really is. They both bring plenty to the Walmart parking lot of tents. And the whiskey business has plenty of examples. Click the photo to visit Allison’s “The Whisky Woman” blog. We’ve written before about Brenne – the little French Single Malt that could. It’s an excellent work-in-progress story of what a small whiskey company can be and how challenging the road for a little tent is. Started by former ballerina Allison Patel with her own notion of craft, Brenne was started 3,500 miles away from her Manhattan apartment building. Craft spirits don’t have to originate from your garage. (Better in someone else’s garage! Less clean-up). Terroir is at Allison’s “coeur” in her Cognac, France based single malt, Brenne. Place matters for her and her whiskey. Allison told her story in Los Angeles at an LA Scotch Club event back in the fall of 2015. Her route took her to a third generation Cognac maker who just happened to be making a recipe-less, “all over the place” house whiskey that was occasionally sold to local pastry shops. After coming to anagreement with the distillery, crafty Allison put a different pirouette on their whiskey by first settling on an actual reproduce-able formula, then having it finished in “wet” Cognac casks, giving the spirit a whole different palette of flavors not tasted in other single malts. And that spirit of the still is very special having tried the New Make recently. Clean, sweet and rich, it could be bottled on its own (HINT! HINT!). But Brenne is not wholly the same, barrel after barrel, like large distilleries produce in the quest for homogeneity across their labels. This un-homogeneity makes Allison extremely happy. Her single barrel whiskey varies in color and flavor. Having seen bottles from various barrels all lined up, the rainbow of rich browns are staggering. One whiskey, many variations. Hands-on, all the way, she chose the iconic Brenne “blue”, picked the name, designed the label and marketing, knocked on doors, and talked to bartenders, spirits buyers, whiskey show looky-loos and anyone else who would listen to the story of her “baby”. She travels to France frequently (poor woman!) to check on her Brenne, barley to barrel to bottle. Quality Control specialist is just another hat she wears. She’s “craft” on a whole different level unencumbered by flowcharts, spreadsheets and memos from the heads of Sales, Finance, Production, Marketing, and HR. She creates those flowcharts, spreadsheets and memos her own darn self, thank you, then e-mails them…to herself. Brenne is a small business through and through with every decision and dollar coming from the heart and head. Delegation for many entrepreneurs is sometimes the greatest personal obstacle to overcome. It’s an art sometimes just to ask someone to get a box of staples for you. How does a one-woman band delegate, or does she? “It’s just easier for me to do it myself rather than taking the time to explain it,” Allison says. But the art is much harder to perfect “when you have no one in the office to delegate to!” and when your product is selling better than you ever dreamed of. She no longer sells every bottle of Brenne herself. “It’s been amazing to be able to empower people in the industry with the knowledge to introduce Brenne to their clients and accounts.” She shifted Brenne’s importation into the US from her own company to Classic Imports (a division of Martignetti) taking a significant load offer her shoulders. “Since 2014, I no longer have had to manage all of the various state-by-state permitting and brand registrations, in-country shipping logistics, staffing at a majority of the tastings around the country in which Brenne participates, managing and executing the training of sales teams, etc. I still happily do a lot of the trainings and tastings when I visit various markets but to have sales managers in place that can consistently stay on top of distributors was a game-changer for me.” Delegation does work and it can snowball. Once you “let go”, it makes it easier to let go of more. But it’s an ongoing balancing act for the one-time ballerina. Beyoncé or Omi’s “Cheerleader” to get a tired body moving again going after a big work night before. 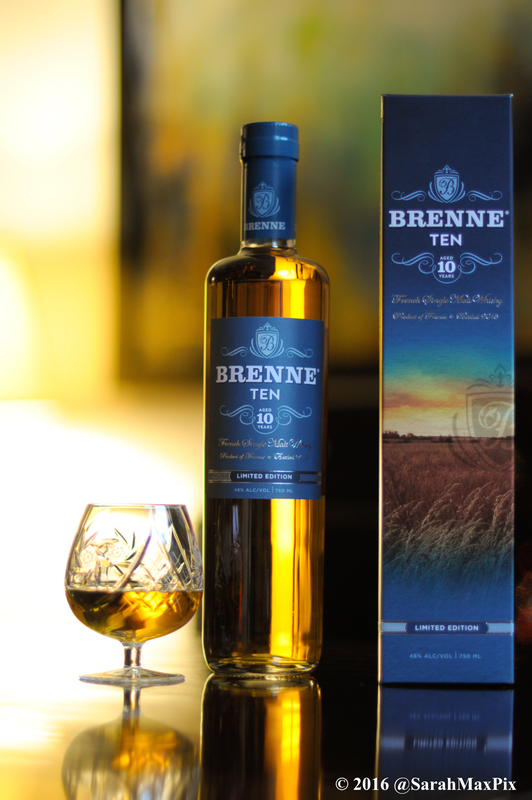 Allison’s current project is a much-anticipated ten year old version of her whiskey; a limited expression marrying four barrels of Brenne that she held back…way back when…you know, in case this Brenne thing ever caught on. Recently released, Brenne Ten is her new big bullet item to keep her up at night, making notes, drinking coffee (and her whiskey), and running on the streets of Manhattan until her Nike’s start barking. She now has 100% more SKU’s by adding another product. That means more headaches and challenges and hopefully triumphs that a new product brings as it changes the workload, daily focus, and thoughts about the brand. A little known and difficult chapter in the Brenne Ten story started when she went to France excitedly to witness the bottling of her first age-statement spirit. What she found on arriving was that the original labels that were made were not at all what she approved. YIKES! (Or whatever the French version of “Yikes!” is.) Ever go pick up your business cards at the printer and find that the phone number is to a pizza place in Wichita, or that the font would be great if your company made balloon animals for kids’ birthday parties? That’s pretty much where Allison found herself. The exception was that she wasn’t at Kinko’s. She was in Cognac, France staring glumly at labels that “weren’t right” after having spent a grueling year on the entire packaging design, and having a team ready for the hand-bottling and packaging. Oh, yeah: a cargo ship awaited for the cases of Brenne Ten to be picked up in 48 hours to make a September launch in the U.S. Cue the dramatic music and start the little timer in the corner of the screen counting down from 48:00:00 since this is when a entrepreneur can either make things happen or not. Significant doubts rumbled around in her brain: Were the labels good enough to use? Did it even matter since the whiskey came in a gift box? No one would really see these labels until they got home, right? Was it worth losing the September launch? Correct the problems and shoot for an October launch and risk distributors not wanting a new item late in the year? Nothing like a printing problem to make you question…everything! Ultimately, it was an easy decision for Allison. She knew that the people who supported her from the simple beginnings along the way trusted her. Releasing something that she didn’t stand behind 100%, even if it meant possibly losing year-end sales, was not acceptable. Losing the trust of her community, friends to business relationships, was even more important since they got her to where Brenne is today. “Luckily, my vendors in France came back to Cognac from their August holidays to rally behind me, re-do the [packaging] work, bottle Brenne Ten and get it on a ship to sail across the Atlantic in time for an October 1st launch.” And that worked out even better since it coincided to the day with Brenne’s 3rd birthday of being on the market. “Luck is the residue of design” according to Branch Rickey. Allison Patel can attest to that. Do things right and good things happen – not always, but much of the time. Crises averted and it’s been non-stop for her promoting Brenne Ten the last few months. It’s no longer just “Brenne” in the marketplace (and really never was). It’s two separate products now: “Brenne Ten”, and “Brenne Estate Cask” which is what the label has always said on the original offering. That means more education down the various channels from distributor to retailer to bartender to casual drinker. And you can buy now Brenne in France(!) which was no small feat by those constantly running feet sine the powers-that-be of regulation and rules seem to make the businessperson’s climb a little harder everyday. But luckily, if you are here in the States, it’s almost everywhere from coast to coast. Before the bloggerverse gets all high and mighty, yes, Allison is a friend which I proudly say. We bonded over a post she wrote a few years back about the spirit of ingenuity in the whisky world, from other small businesses. Thinking outside the box as she wrote should be commended and encouraged. The little tents are so often where the spirit figuratively gets started, moving from dream to reality. Brenne is definitely that reality for her. #PhillyFood News Flash: The Brewer’s Plate Tickets are Now On Sale! Big fan of Brenne. Hope we can get it in Canada one day. Cheers on an outstanding article Aaron but you Americans have to eventually get in step with the rest of the world and learn to spell whisky with no “e” (unless you are talking bourbon or Irish whiskey). I’ll check with Allison to see if she can work some magic to get Brenne into Edmonton. All that and she is impossibly pretty, too! Nice write-up, bringing the status of Brenne up-to-date. Its been a story I’ve watched from the distance and happy to see she is having success. I’ve been watching this story and can’t wait to have an opportunity one of these years to sample Brenne! Thanks for all the insights and update.